In a land dominated by expansive landscapes, it’d be remiss to always take the quickest route from A to B. To fully appreciate this Great Southern Land and its diversity, it’s time to put down the boarding pass and pick up the road map. Here, 10 epic road trips that take in the very best that Australia has to offer. Exactly as it sounds, the Big Lap is the circumnavigation of this vast country. This road trip follows the some 15,000 kilometres of Highway One, which links seven of the capital cities, roughly skirting the coastline between Sydney, Brisbane, Cairns, Darwin, Broome, Perth, Esperance, Adelaide, Melbourne and Hobart. Why is it one of the greats? If you have the time (we’re talking six months at least) and a 4WD, this road trip will be one of the most epic journeys you’ve ever taken. The route takes in everything from big city lights to sleepy coastal towns, verdant green rainforest to dusty red outback, remote waterholes to sugar-white beaches, ancient rock art to kitsch big things; it’s everything great about Australia in one continuous road trip. For the ultimate itinerary, be sure to detour off the Stuart Highway in NT to include Kakadu, Uluru and Alice Springs. Maximise good weather by spending April to September travelling across the north of Australia between Broome and Cairns. This is the dry season when temperatures are pleasant and all roads are generally open (during the wet season they can be closed). One of the country’s most famous road trips stretches along its southern coast from Torquay to Allansford in Victoria. Why is it one of the greats? 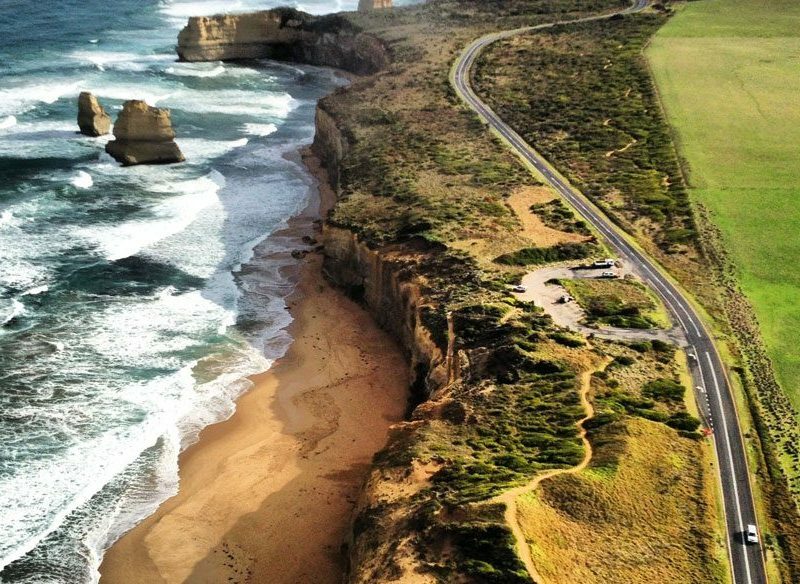 Taking a trip along the Great Ocean Road is an Australian rite of passage. 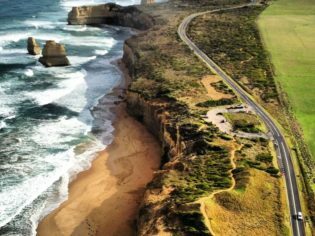 It winds 243 kilometres along some of Australia’s most stunning coastline, taking in rainforest, sunburnt cliffs, shipwrecks, and, of course, the famous Twelve Apostles – of which there are now eight. Explore Port Campbell National Park further than the Apostles. It’s also home to Loch Ard Gorge, site of a 19th-century shipwreck; the Island Archway, which collapsed in 2009; and the cliff-face Gibson Steps. If you’re only driving in one direction, start in Torquay so you’re on the ocean side of the road, making it easier to pull over for lookouts. The Munja Track, the Kimberley’s next epic driving adventure? Constructed in the ’60s to transport cattle stock, this 660-kilometre road cuts right through the belly of WA’s Kimberley from Derby to Wyndham. This is a 4WD adventure like no other, taking in the magnificent and remote wilderness of the Kimberley, with outback cattle stations, ancient gorges, thundering waterfalls, sacred Aboriginal sites and rock art, a unique pioneering history, and fascinating characters. Bell Gorge; it’s a mission to get to, but you won’t regret it. This multi-tiered waterfall cascades down layered sandstone into several pools and is perfect for swimming. Petrol is really expensive on the Gibb River Road, and there are only two roadhouses along the way – at Imintji and Mt Barnett. Only Mt Barnett sells petrol, both sell diesel. One of the infinite numbers of wonderfully windswept pit stops on your East Coast of Tasmania road trip. From historical Hobart to the exquisite Bay of Fires, this road trip follows the coast via St Helens, Swansea and Bicheno. Stunningly beautiful and blissfully quiet, Tasmania’s East Coast boasts bountiful produce including wine, cheese and seafood, walking tracks with ample wildlife spotting, empty beaches, and a unique convict history. Be sure to take a little detour to Freycinet National Park, an area rich in granite mountains, peaceful bays, azure waters and prolific birdlife, and if you have time join the award-winning Freycinet Experience Walk. If you’re in the Apple Isle for a long period, consider bringing your own vehicle from Melbourne via the Spirit of Tasmania to save money on car rental. This 1000-kilometre drive begins at Cairns, the gateway to the Barrier Reef, and ends at mainland Australia’s most northern point, Queensland’s tip, Cape York. Made up of red dirt, croc-infested river crossings, ancient rock art, and lush rainforest, this scenic route encompasses the Wet Tropics, an area where two World Heritage areas (the Reef and Daintree) meet. The Quinkan Galleries at Laura is a collection of rock art believed to be as old as 30,000 years. Guided tours are available through the Quinkan & Regional Cultural Centre. The scenic coastal route via Cape Tribulation, the Daintree and the Bloomfield Track requires 4WD, whereas the inland route follows the fully sealed Mulligan Highway. Just under 1200 kilometres, this west coast drive takes you from Perth to Exmouth along WA’s stunning Coral Coast via Cervantes, Geraldton, Monkey Mia and Carnarvon. Between June to September you’ll also be wowed with the colourful wildflowers that carpet this arid landscape. Supplies north of Carnarvon are limited and expensive, so be prepared prior to this. Starting in Wangaratta in the state’s north-east, this road trip winds its way some 500 kilometres through Victorian High Country to Metung in Gippsland Lakes area. Australia’s highest accessible sealed road takes in mountain ranges, deep valleys, wine regions and the sparkling waterways of the Gippsland Lakes region. This scenic beauty is interjected with quaint historic towns including Beechworth, Bright and Omeo. Victoria’s highest alpine village, Mt Hotham, is a treat year-round, with excellent downhill skiing and cross-country trails (245 hectares) as well as trekking, horse riding, and fishing in the warmer months. If driving this route during winter, be sure to have Diamond Pattern wheel chains fitted to your car, ensure you have a full tank of fuel, and drive slowly and carefully. The Savannah Way: 3700km of pure adventure from Queensland all the way to WA. Linking Cairns in Tropical North Queensland with Broome in WA’s stunning Kimberley region via Northern Territory, this route is approximately 3700 kilometres. Encompassing 15 national parks and five World Heritage areas, this is the ultimate east to west road trip. Expect to see everything from tropical rainforest to vast grassy plains, remote cattle stations to waterfalls and gorges, and ancient rock art to turquoise waters. Boodjamulla National Park is one of Queensland’s best-kept secrets. It boasts spectacular gorges, ancient fossils dating back a staggering 25 million years, and a landscape of vivid colours of orange sandstone cliffs and emerald waters. This is the outback, so be prepared. Although a 4WD is not completely necessary (there are alternate routes for 2WDs), it’s strongly recommended that you carry a radio for when mobile reception is sketchy. Australia’s straightest road trip: the Nullarbor Plain. The Nullarbor stretches 1256 kilometres between the goldfields of WA and the Eyre Peninsula in SA. This legendary, (almost) treeless plain meets with the towering sea cliffs of the Great Australian Bight. It’s home to prolific wildlife (emus, kangaroos, dingoes, camels…) and a series of unique caves, interesting outback characters, and the world’s longest golf course. The ruins of Eucla Telegraph Station, built in the 1870s for the overland telegraph, which are slowly being swallowed up by ever-shifting sand dunes. The Nullarbor is sealed but it’s very remote, so it’s essential to be prepared when driving the outback with a full tank of fuel and plenty of water. Accommodation is basic at best – roadhouses and camping. The Legendary Pacific Coast follows around 900 kilometres from Sydney to Brisbane through the Central Coast, Port Stephens, Newcastle, Coffs Harbour, Ballina and Byron Bay. Why is it one of the greats? This is classic coastal Australia: a host of surfing beaches, charming seaside towns, pretty hinterland and national parks, all found between two exciting capital cities. For a change of scenery, detour west of Newcastle to the Hunter Valley region, renowned for Semillon and home to some incredible restaurants and boutique cheese, olive and chocolate producers. Leave yourself at least five days to do this trip so you can get off the Pacific Motorway as much as possible. The Grand Pacific Drive is a 140 kilometre scenic coastal drive taking you through rainforests, over the iconic Sea Cliff Bridge and through the coastal cities and townships of Wollongong, Shellharbour, Kiama and the Shoalhaven. Showcasing some of NSW’s most beautiful beaches, the Grand Pacific Drive also drives you through some of the state’s most beautiful cliff faces. A chance to stop at Kiama and witness the powerful blowhole.